While driving a motorboat around the Twin Lakes, Nancy and her friend Helen get caught in a dangerous storm. Luckily, they are rescued by another teenage girl in a rowboat. They soon learn that their rescuer is Laura Pendleton, whose mother has recently having passed away. Laura has come to meet up with her new guardians, but something isn't quite right about them. 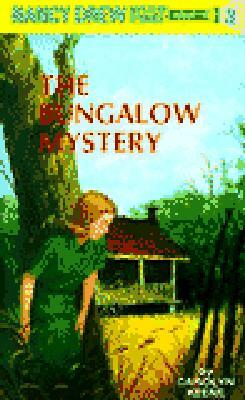 Nancy investigates the situation, and soon she stumbles upon a shocking surprise in the cellar of a bungalow! Carolyn Keene is a pen name used by a variety of authors for the classic Nancy Drew Mystery series. The first author to use the pseudonym was Mildred Wirt Benson, who wrote 23 of the original 30 books. Other writers who have adapted the "Carolyn Keene" moniker include Leslie McFarlane, James Duncan Lawrence, Walter Karig, and Nancy Axelrod.